Poetry & Popular Culture doesn't normally make a habit of sending you elsewhere via hot links like so many other blogs do. 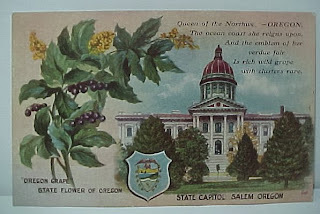 Why in the world would we want you to leave when there are tons of tasty treasures to explore here together—treasures like the postcard pictured above, for example, which features a drawing of the second Oregon State Capitol building, built in the 1870s to replace the first which burned down in 1855. This second capitol suffered the same fate as the original, however, burning down in 1935. Thanks to WPA funding, though, yet another capitol was built and opened just three years later, in 1938 (see the new building pictured below). It's kind of funny to stroll by the place today—there are some great Depression-Era murals painted inside—and think about how all of Oregon's present-day tax-haters are pursuing their tea party agendas inside of a building that likely wouldn't have happened without $2.5 million in federal funding. 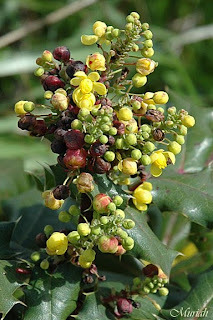 Is rich wild grape with clusters rare. It's a puzzling bit of verse to be sure, and we're not exactly sure how to parse it—especially the quasi Christian, three-in-one logic that seems to unite the sentence's three parallel subjects (the "Oregon" of line one, the "ocean coast" of line two, and the "emblem" of line three) in the image of the official state flower, the "rich wild grape" of line four. 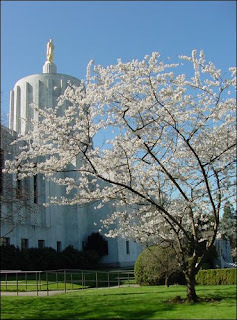 Nevertheless, we do have to admire the poem's use of "reigns" in line two, which puns on the dominant meteorological feature of Salem and suggests that legislative power in Oregon runs east-to- west, contrary to the weather, which primarily comes in from the coast, moving west-to-east. 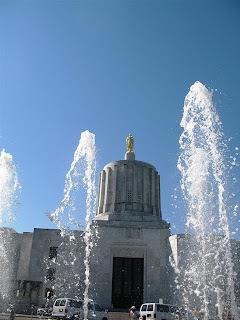 And is it just us, or is it possible that "fair" in line three puns on the fact that Salem is not only home to the state capitol but also the Oregon State Fair, started way back in 1858? The key to this polysemy—or so one of the office interns suggested in a moment of particular clarity—might be in the poem's use of "verdue," which, according to the OED, is an irregular variant of "verdure." Not only does the less frequently used "verdue" seem appropriate in a poem about wild grapes with "clusters rare," but suggests that a fecund landscape marked by a great abundance and variety of plants is also a landscape in which words and meanings proliferate as well. Hence the puns on "reigns" and "fair." Hence the capacity of a single image like the wild grape to have multiple, equally viable referents (the State, the ocean coast, and the emblem). 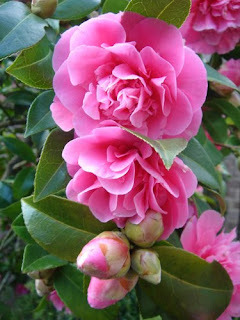 It's spring here in the Cherry City, however, and so perhaps our reading of these four lines is affected by the amazing number of strange and unusual things growing outside. Everywhere we look, it's flowers, flowers, flowers, moss, moss, moss, and rainbow, rainbow, rainbow. All of this greeny world has us thinking about generation and multiplication more generally, and hence comes our recommendation to check out David Alpaugh's "The New Math of Poetry" which recently appeared in The Chronicle of Higher Education. 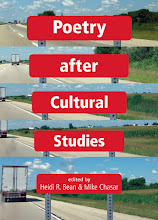 Here, Alpaugh tries to come to terms with "the astounding number of poems being published today" and writes, "Unfathomable are the countless self-published chapbooks and collections printed each year, to say nothing of the millions of personal Web sites, blogs, and Facebook pages where self-published poetry appears." We here at the P&PC Office can't say that we agree with many of Alpaugh's suppositions—that this "boom" is a brand new phenomenon (it isn't), or that the next Blake or Dickinson may be lost in the process (not our major concern), or even that the question "Who are the best poets writing today?" is even the most important question to be asking (cuz it ain't)—but we do appreciate the underlying recognition that poetry is happening, and has happened, in many more ways, in many more forms, and among many more writers and readers than histories of the genre typically grant. For Alpaugh, this is something of a nightmare. For us, it's a dream.